Feeling a Pebble in Your Shoe? If you are feeling as if there is a pebble in your shoe, there may not literally be a rock in there, but there is real reason for the pain. Often when patients describe the feeling of foot pain, as if from a pebble within their shoes, or discomfort caused by wrinkled up socks, they are actually suffering from pain due to the presence of neuromas or fibromas. Yet, there is no reason to put up with the pain–all you have to do is visit our doctors at the Beaver Valley Foot Clinic! Foot pain can be caused by basic over exertion with daily and over-use, or can emanate from other, more serious issues. Be it plantar fasciitis (heel pain) or warts, fibromas (the most common, benign of foot tumors), neuromas (stemming from a pinched nerve in the foot), no matter the cause of your foot pain, our doctors at the Beaver Valley Foot Clinic are here to treat your discomforts as quickly, affordably and as pain-free as possible. We accurately identify and professionally treat your foot pain, with sincere care. Not only that, even though we are among a board certified surgeon, we leave surgical treatments of foot pain for only severe cases, as a very last resort. Since we do not agree with surgery as a first resort for treatment, our team makes use of Cryotherapy for the treatment of several issues, include those discussed above. This method of treatment enables our patients to have an in-and-out visit, leaving the same day as treatment. It involves a localizing and freezing of the nerve associated with the pain, and has been around since the 1960’s for several different treatment uses. This is done with a Cryopac machine, utilizing extremely cold temperatures to cause demyelinization of the sheath around the nerve, decreasing its ability to transmit pan signals. Since Cryotherapy is not a fully invasive surgical procedure, you’ll be leaving with only a Band-Aid and severely less pain afterward. 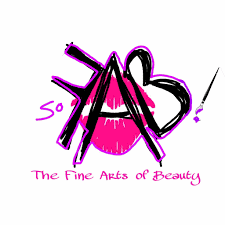 Our success rate is about 92%! Also, cryotherapy is covered by most insurance companies! It is a treatment that’s a relief to you, your feet and your wallet. Dr. Teimouri is one of only a few podiatrists in the city to receive advanced training and certification in Cryotherapy for foot use. 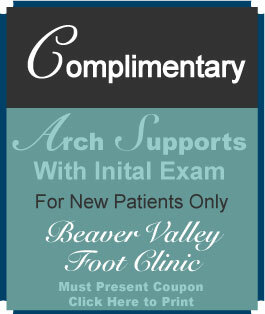 In so, she is raising the bar in the Pittsburgh area, and chose to do so with the Beaver Valley Foot Clinic. Dr. Teimouri and the rest of our phenomenal staff take care of your foot pain, with certified skill, care and expertise, while leaving surgery as an absolute last resort. Contact us today by giving us a call, or stopping by for a visit to get more information and schedule an appointment. 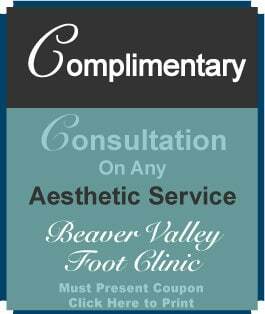 There is no reason to put up with foot pain–all you have to do is visit our doctors at the Beaver Valley Foot Clinic!